Well...we're at Disney World. Just spent a really hot day in the Magic Kingdom! Even got Janet on a roller coaster. A really big disappointment though...after spending over $70 a ticket, two of the major rides were not operating...Haunted Mansion and Space Mountain. The park is quick to get you in the gift shops but can't deliver on the rides. The second thing I noticed was that some of the people were bordering on rude. We extended our stay at Ft. Wilderness RV Resort one more day and you would have thought the concierage was doing us a favor! We've been coming to Disney for years and this is the first disappointing time we've had. We have two more days of tickets...let's hope Epcot and the Animal Kingdom are better than the Magic Kingdom!!! Between the three of us, we've got 8 grandchildren and were talking about bringing all of them but we may rethink that....it's just not as good as it used to be for the money! My last trip was only two years ago and it's gone downhill since then. The funniest thing is that I made the reservation, paid for the vacation with my credit card, and they put everything in Janet's name....hopefully they will not kick us out when she leaves on Wednesday and we're here til Friday!!! If you book, use www.disneyvacations.com and don't call and make the reservations over the phone...they aren't too with it! Especially when they don't ask about slides and awnings and pets for the site assignment! We'll let you know if it gets better!!! No, I don't want to go back to work! 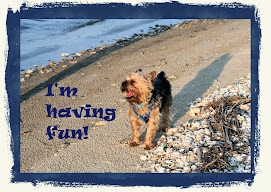 For all of you who worry that I'm bored....I'm not! Yesterday Woody took me into the woods in a golf cart where we found the butterfly above! 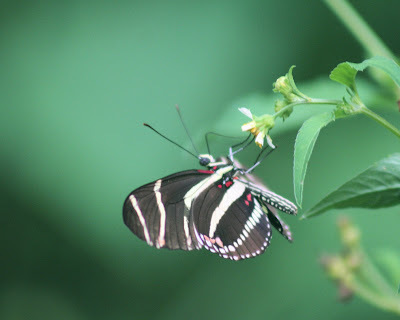 It's a Zebra Longwing, the state butterfly of Florida. I don't think that anyone can accept the fact that I'm really retired! and, no, I don't want to go back to work! From the recruiters who keep calling to well-intentioned friends, I keep getting queried about what I want to do. Well, surprise...I'm doing it. I love the travel in our RV, photography, writing Haiku and turning them into Haiga, medical editing, seeking out stuff to sell on eBay, and occasional consulting. The only drawback I've seen thus far is that when I go shopping, I don't really need anything! If it's not shorts or jeans and t-shirts or sweaters, I don't need it! I still have the requisite black suit for work and at the rate I'm going, it will never wear out! We'll be in Ocala one more week and then on to Disney. Today, we went to Miconopy...a darling antique center just north of Ocala. I got ruby and silver candle sticks that I adore so no eBay for them! Not sure what's on the agenda for the weekend...we'll see!